Handlebar grips Beston fat grip Gran Tourismo Fits 1 Bars. Handlebar grips, Beston fat grip (Gran Tourismo), Fits 1" Bars. This is a pair of Beston or Gran Tourismo style handlebar grips, they are a 1 inch diameter handlebar version of the instantly recognisable "fat grip" as fitted to a lot of British twins and singles in the 1960s and 70s. They fit 1" diameter bars and are 5 1/4" in length. The left grip has an ID of 15/16" and the throttle side ID is 1-1/8". 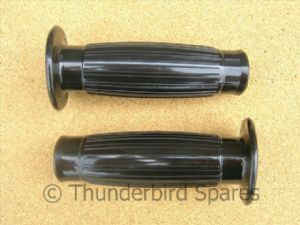 If you need the original type for 7/8" bars please see our other listings.